AMS Bowfishing’s (www.amsbowfishing.com) Safety Slide System ($8 per two 5/16-inch size, $15 per five 22/64-inch size) is a must for any fish arrow. Tough, self-cleaning slides fit 5/16- or 22/64-inch arrows, stopped at front by the point, rear by an installed shock pad, the line carried by the slide to keep it from tangling during the shot. AMS’ new 5/16-inch Tiger Shark Arrow ($16 alone, $26 to $35 with point) is nearly indestructible with its special composite core wrapped with carbon. A custom tail accepts press-fit nocks for easy field replacement. Cajun Archery’s (www.cajunarchery.com) Piranha Point ($7) includes a faceted, replaceable tool-steel tip. The stainless steel body holds a single-piece, hinging, spring-steel barb made to hold fish tightly but allow fast removal. Comes in standard and long-barb models (for soft fish). Cajun’s Yellow Jacket Arrow ($7; $18 with points and Safety Slide) fuses five layers of black carbon to a fiberglass core, creating nail toughness and a 65-percent-stiffer spine for high-pound bows. They come with or without AMS Safety Slides, bare or with several fish point options. Innerloc’s (www.innnerloc.com) Glass Max ($6) and Glow Max ($8) are standard 5/16-inch-diameter, luminescent points great for nighttime bowfishing. Two-Barb ($14) and 3-Barb ($15) Grapple fish points provide accuracy and tremendous holding power without sacrificing durability. Matched-weight Practice Points ($5) are also offered (perfect for honing skills on Rinehart’s Innerloc Gar Target—$80). Steel Force Broadheads’ (www.steelforce.com) Carp ($9) point includes replaceable 1-inch-wide, .050-inch-thick titanium blade opposed by .080-inch diameter titanium barbs. The ferrule’s galvanized for corrosion resistance. Bohning’s (www.bohning.com) Ruff-Neck Ultra Bowfishing Point ($10) allows reversing barbs with one turn. The wide, reverse-angle barbs are ideal for soft-bodied fish. The barbs’ leading edges include cutting edges for added penetration. Constructed of stainless steel with chisel tip for penetration and durability. Muzzy Product’s (www.muzzy.com) Big Fish Adaptor’s ($6) is designed to better hold on to big, soft-bodied fish by adding a second set of barbs between Muzzy’s Quick Release ($18 with Adapter included) bowfishing point body and trocar tip. Muzzy’s Carbon Classic ($25 to $34, including point) arrow is super-straight and strong, available in standard 5/16- and larger 22/64-inch diameters. AMS Bowfishing’s (www.amsbowfishing.com) Retriever Pro’s ($87), the newest incarnation of the company’s revolutionary zero-drag bottle reel, now includes a larger padded retrieval trigger, arrow holder, telescoping clamp, two AMS Safety Slides, and 25 yards of 200-pound Hi-Vis Orange line. The Traditional Mount Kit’s ($27) a must when using traditional bows sans accessory taps. Attached to recurve or longbows via stout rubber straps, it accommodates side-mount AMS Retriever reels, or front-mount spinning or drum reels. Cajun Archery’s (www.cajunarchery.com) Machined & Anodized Aluminum Spinning Reel Mount ($25) is the company’s toughest reel seat. It screws into standard stabilizer bushings. Threaded lock-downs accept a close-face spinning reel, threaded ends accept a fishing-rod attachment. Smooth Machine’s (www.smoothmachinellc.com) 7-ounce Pro Reel Seat ($30) is USA-made and built to last a lifetime, milled from T-6061 aluminum and featuring all stainless steel hardware. Patent-pending design makes attachment and positioning a snap. AMS Bowfishing’s (www.amsbowfishing.com) new Apex Fiber Optic Single Pin Sight ($60) includes a vertical .019-inch, wrapped and protected fiber pin for bright low-light aiming. A 1.8-inch aperture with luminescent outer ring, laser adjustment marks, and V’o’et LED light are included. Innerlok’s (www.innnerloc.com) new Depth Seeker and Depth Seeker II ($50 and $80) sights take the guesswork out of bowfishing. Aiming grids provide reference while shooting, allowing beginners to learn faster and veterans to shoot more precisely. They’re made from solid aluminum with stainless hardware. PSE Archery’s (www.pse-archery.com) Light Stryke Bowfishing Sight ($130) uses a powerful 5mW green laser that diffracts in water, allowing point-on aiming no matter depth or angle. It is fully adjustable and includes remote pressure switch activation. Hawglite’s (www.hawglite.com) Marauder Lighting System ($130) is stabilizer-mounted, providing hours of 68- (red) to 110-lumen (white) run time from three AAA batteries. It is light-angle-adjustable to correlate to arrow impact. It includes white, red, and green lenses and remote pressure switch. AMS Bowfishing’s (www.amsbowfishing.com) Big Game Retriever Pro ($90) is slotted, allowing tying off to floats or deep-sea bait-casting rod and reels to fight the big ones. It comes with 400- or 640-pound-test Spectra line and two Safety Slide kits. 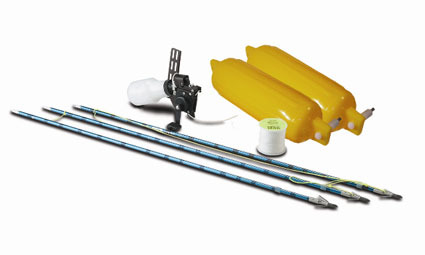 AMS also offers a Big Game Retriever Pro Combo and AMS Gator kits. Muzzy’s (www.muzzy.com) Gator Getter Kit ($280) has everything needed to tackle large bowfishing targets, including slotted Gator Reel with 600-pound Gator Cord installed, extra Gator Cord, Muzzy Gator Getter Arrows with detachable points, and two Big Game Floats with stabilizer adaptors. Muzzy’s Water Activated Strobe Light’s ($10) is a great addition while bowfishing big targets at night. Its powerful strobe helps keep track of progress after the shot. Innerloc’s (www.innerloc.com) 3-Barb Gator ($16) and Bladed Tip ($13) are optimized for tackling big game such as alligator. The Bladed Tip fits all Grapple points and offers devastating bleed-out on large targets. Steel Force’s (www.steelforce.com) Gator ($17) tip features a two-piece steel ferrule with galvanized coating, holding a.050-inch titanium front blade with offset barbs and opposing .080-inch titanium cross-barbs. The replaceable, 1.5-wide cut-on-contact blade assures deep penetration and extreme ruggedness. The Gator ferrule separates from your arrow to prevent pullout during long fights.